I was so excited to see a new series beginning by Lynette Eason and finally had a chance to dive into book one. Here's a short blurb, and we'll chat on the other side! This was a fast-paced start to Eason's new Blue Justice series. It's been some time since I've read a book by her, and opening the pages of this one was like catching up with an old friend. Eason does a masterful job of pulling you straight into the action while tugging at your emotions. This allows the reader to fall for the characters and cements us into their lives. I loved the glimpses of each family member in this new series and cannot wait for their stories. The suspense plot moved quickly and seamlessly with two strong characters who shared their vulnerabilities with one another. The fact that they'd been friends for so long lended a realism to them falling in love in what some may consider a short timetable. Eason wove a story that hits both the romance and suspense of this genre in such a way that I'm already ready for the next addition. If you're a fan of romantic suspense and haven't had a chance to read this one yet, I highly recommend it. 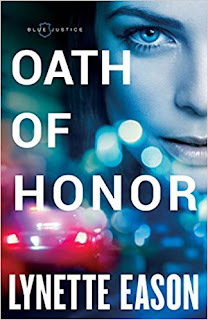 You can purchase Oath of Honor here. Not a fan of suspense, but this caught my eye!